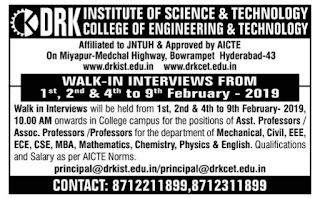 DRK Institute of Science and Technology, Hyderabad has advertised for the recruitment of Teaching Faculty-Associate Professor,Assistant Professor,Professor, non teaching faculty jobs vacancies. Interested and eligible job aspirants are requested to walk-in 1st,2nd,4th to 9th February 2019. Check out further more details below. 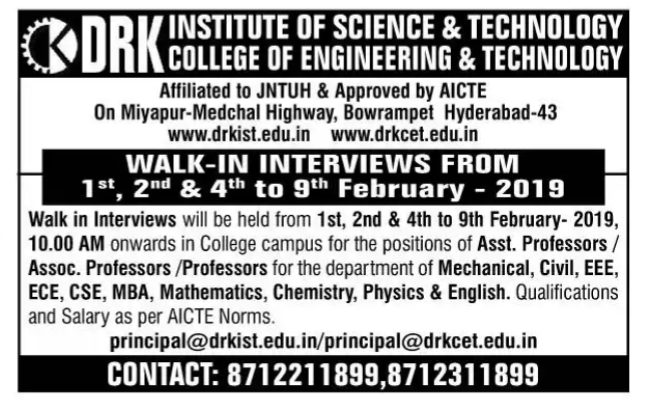 Name of the College: DRK Institute of Science and Technology, Hyderabad. How to Apply: Interested and Eligible candidates are requested to attend the Walk-in interview to the following walk-in address. Walk-in Date:1st,2nd and 4th to 9th Feburary 2019.